PRINCESS is a happy-go-lucky girl, about 9 mos old now. 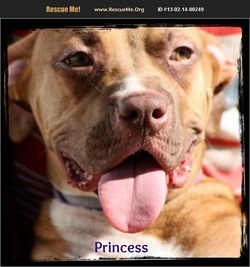 Loves to play, gets along great with other dogs and would be a good running partner. Plenty of energy! She is a boxer mix and acts accordingly. High energy, curious, and smart! She is already spayed, HW negative, and up to date on vaccines. Let Princess show.YOU how much fin she can be! Great temperament!